Background: Atraumatic restorative treatment (ART) approach was developed in the mid-1980s to provide dental preventive and restorative care to underserved populations in areas that are out of reach. This method consists of the removal of infected (soft demineralized carious) tooth tissue with hand instruments only followed by restoring the cleaned cavity and associated pits and fissures with an adhesive restorative material. However, survival of ART restoration is a matter of intense speculation. Aim: To conduct a systematic review of the literature on the survival rate of ART restorations. Materials and Methods: A systematic search was carried out in MEDLINE, PubMed, and Cochrane databases from 1998 to 2014 using the term survival of ART in permanent teeth, primary teeth, ART restorative material. Results: The analysis of abstracts led to the selection of 36 studies. The research reports a survival rate of ART restoration for <2 years, 2–5 years, and >5 years ranging from 44.8% to 100%, 24.4% to 90%, and 72.6% to 86%. Survival of ART restoration is reported to be marginally higher in permanent molars compared to their primary counterparts. Conclusion: This systematic review revealed high survival rates for single-surface ART restorations in both primary and permanent molars. However, long-term clinical studies are scarce, and a level two and level three evidence was observed. Introduction: Tongue cleaning has been shown to be effective in preventing plaque formation and reducing oral mutans streptococci (MS) when used in combination with other oral hygiene procedures. 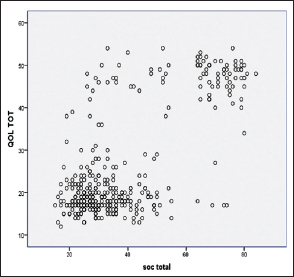 However, correlation between MS counts and plaque levels remains to be demonstrated. Aim: To evaluate the effect of tongue scraping and tongue brushing on salivary MS and plaque levels. Materials and Methods: A triple-blind three arm randomized controlled parallel-group trial was carried out among 54, 12–15-year-old boys in a residential school in Bengaluru city. 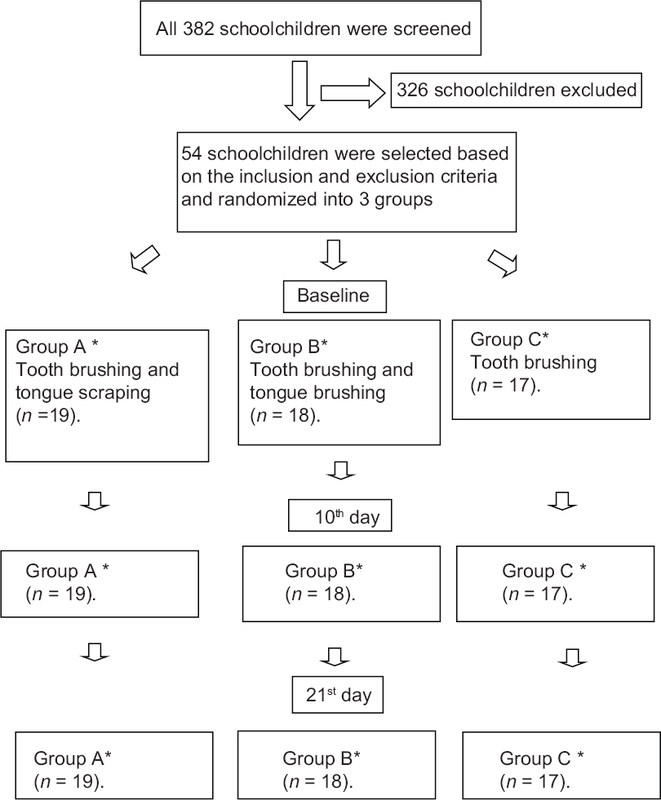 The study participants were randomly allocated into Group A (toothbrushing and tongue scraping; n = 19), Group B (toothbrushing and tongue brushing; n = 18) and Group C (only toothbrushing; n = 17). The clinical procedure included a collection of saliva and recording of plaque index at baseline, 10th and 21st day. Salivary MS counts were determined using mitis salivarius bacitracin Agar media. ANOVA, Wilcoxon's signed-rank sum test, Mann–Whitney U-test and Spearman's correlation test were performed on log-transformed CFU/mL of MS. Results: The tongue scraping and tongue brushing groups showed statistically significant reductions in salivary MS counts after 10 days (4.76 ± 0.54) (4.79 ± 0.44) and 21 days (4.50 ± 0.44) (4.41 ± 0.57) respectively when performed along with toothbrushing. However, differences between the interventions were not statistically significant. Furthermore, there was no statistically significant reduction in plaque levels after 10 and 21 days. Conclusions: Tongue scraping and tongue brushing were equally effective in reducing salivary MS counts when used in combination with toothbrushing, however, their effect on reducing plaque levels was not significant. Hence, tongue cleaning is recommended as an adjunct to toothbrushing. Introduction: Poor oral health and untreated oral diseases have a significant impact on quality of life. Oral and general health of cracker workers is in association with their working environment. Aim: To assess the oral health status of cracker workers in Sivakasi. Materials and Methods: A total of 350 subjects were included in this study. The subjects were randomly selected from 10 companies in Sivakasi. 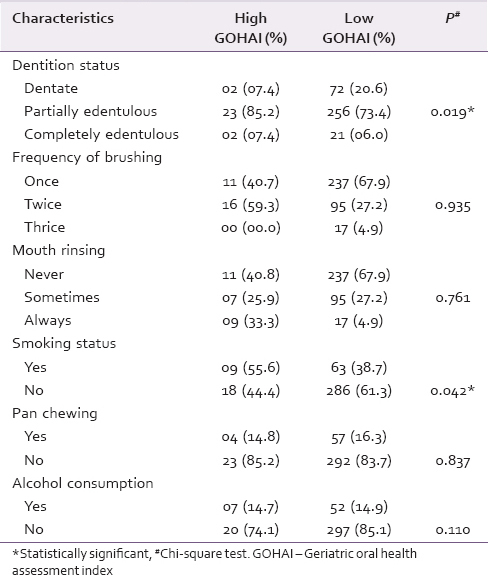 Data were collected by using WHO Oral Health Assessment Form for Adults (2013). The proforma included questions on knowledge, attitude, and practices of oral hygiene. Statistical analysis was performed using statistical package for social sciences version 16.0. Results: Among 350 subjects, 34.9% were males and 65.1% were females. The mean number of decayed, missing, and filled teeth was 2.52, 4.17, and 1.32, respectively. The mean of sextants with shallow pockets is 5.9 and its percentage is 54. The mean of sextants with deep pockets is 1.5 and its percentage is 14.6. Oral lesions were found to be present among 4.3% of study subjects. Conclusion: Workers of fireworks industries those with dental caries, periodontal problems, and other dental complaints should be examined repeatedly for their oral health status. Introduction: Periodontitis is referred to as the sixth complication of diabetes mellitus. If left untreated, periodontitis can lead to tooth loss, thereby compromising a patient's ability to maintain a proper diet and affecting the quality of life. 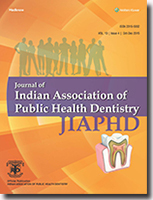 Aim: To assess the periodontal status among type II diabetic and nondiabetic individuals in Chennai city. Materials and Methods: A hospital based cross-sectional comparative study was conducted among diabetics and nondiabetic population attending a government hospital in Chennai city. The WHO Oral Health Assessment Form (1997) was used to assess the periodontal status. The final sample size of the study was 1000 which included 500 diabetics and 500 nondiabetics. Results: This study showed a significant association between the diabetic status and periodontal disease. The severity of periodontal disease was high among diabetics when compared to nondiabetics. The mean number of sextants with shallow pockets was 0.76 ± 1.20 among diabetics and 0.49 ± 0.86 among nondiabetics (P < 0.0001). The mean number of sextants with Loss of Attachment score of 1 (4–5 mm) was 0.67 ± 1.05 among diabetics and 0.32 ± 0.70 among nondiabetics. Conclusion: Periodontal disease was more frequent and severe in diabetic patients as compared to nondiabetics although there are a number of questions need to be answered in future research. Introduction: Deleterious oral habits are possible causes of unbalanced functional forces on the developing dentition and are factors in the development of dento-skeletal abnormalities and hence possible etiologic factors in malocclusion. Therefore, recognition and elimination of deleterious oral habits is of utmost importance. Aim: To assess and district wise map the prevalence of deleterious oral habits among 10–16-year-old children in Karnataka. Materials and Methods: A cross-sectional was conducted over a period of 2 years from January 2012 to January 2014. With 95% confidence level, the sample size of 9505 was estimated using population proportionate technique. The list of schools provided by the Karnataka Higher Primary and Secondary Education Board were stratified district wise, and then the required number of subjects was chosen by simple random sampling method. Oral habits were diagnosed using data gathered from a clinical examination of occlusion and extra-oral assessment of the face, combined with the history of habits from parents and guardians. Z-test for proportions was used to compare the prevalence between the genders. Results: The study demonstrated a low prevalence of 6% deleterious oral habits, and tongue thrusting was the most prevalent habit found in 2% of children. The highest prevalence of 12% was found in the district of Karwar. There was no significant difference of deleterious oral habits between the genders (P = 0.315). Conclusions: Highest prevalence of 12% was observed in Karwar district. Overall a low prevalence of 6% was found in Karnataka. 2% prevalence of tongue thrusting was the most prevalent habit. Introduction: Healthy teeth are important for any section of society. Dental caries, the product of man's progress toward civilization, has a very high morbidity potential. Fluoride has been recognized as one of the most influential factor responsible for the observed decline of caries among children as well as adults of these countries. While fluoride is accepted as an effective method to prevent caries, the excessive consumption of fluoride can put teeth at risk of developing dental fluorosis. Aims and Objectives: To assess the prevalence of dental fluorosis among 12–15 years old government and private school children of Bharatpur city, Rajasthan. Methodology: A cross-sectional study was carried out on total 1400 school children, out of which 700 school children were from government schools and 700 were from private schools. Simple random sampling methodology was used to select the sample. The subjects were examined for dental fluorosis according to WHO 1997 assessment form. Results: The prevalence of dental fluorosis was found higher among government school children, that is, 54.5% when compared to private school children, that is, 45.5% respectively, and this difference was found to be statistically significant (P ≤ 0.05). Conclusion: The study showed the increased prevalence of dental fluorosis among government school children as compared to private school children. Dental fluorosis was found to be the major public health problem among both government and private school children of Bharatpur city which needed immediate attention. Regular dental check-ups and routine oral hygiene practice will enable them to lead a healthier life. Introduction: Oral diseases qualify as major public health problems owing to their high prevalence and incidence worldwide. Access to oral healthcare refers to patient's ability to obtain or utilize oral healthcare. Aim: To assess the dentition status and treatment needs among 6–12-year-old school children and to assess the factors affecting utilization of dental care among parents. 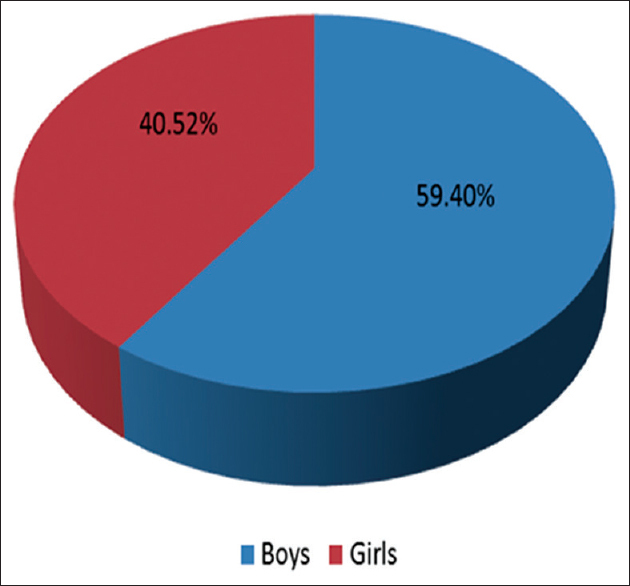 Materials and Methods: A cross-sectional survey was conducted among 420 school children (6–12 years) in Bangarpet taluk. Factors affecting utilization of dental care were assessed using a validated questionnaire and dentition status and treatment needs was recorded according to WHO 1997 proforma. Descriptive and inferential statistics were used. Results: The proportion of children with dmft was 62 (30%) and 54 (26%) in urban and rural children, respectively whereas the proportion of children with DMFT was 48 (23%) and 79 (38%) in urban and rural children, respectively. Among urban children 99 (47%) did not need any treatment when compared to 87 (41%) rural children. Around 32 (15.2%) needed one surface filling in urban children and 20 (9.52%) in rural children. About 30 (14.28%) urban and 40 (19.04) in rural children needed preventive care, respectively. Most of the parents were not aware of fluoride content in the toothpaste. Parents agreed that maintenance of oral health is their duty. There was a significant difference between urban and rural parents for the barriers "no time to visit" (P = 0.0002), "affects my work" (P = 0.048) and "scared of injection" (P = 0.0033). Dental visits were found to be low in both urban 37 (18%) and rural 56 (27%) children. Conclusion: The caries experience was similar among urban and rural children. Most of the children required restorative and preventive care. 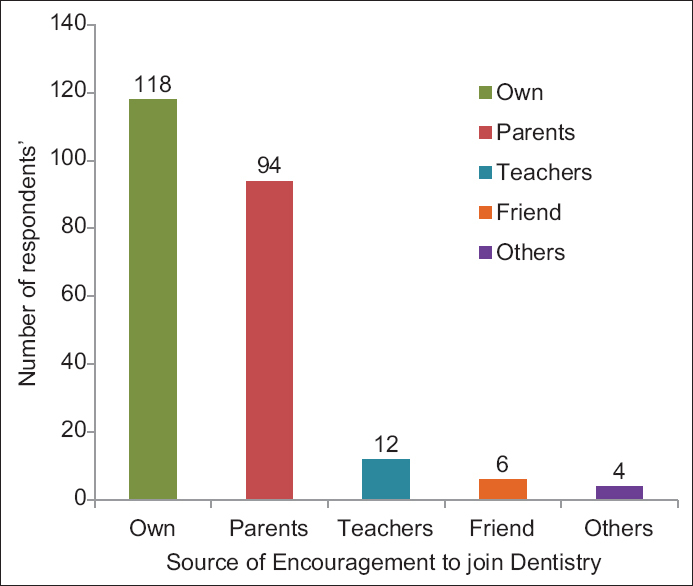 Fear of injection and lack of time to visit dentist were the major barriers to parents for utilization of dental care. Hence, integrated approach is suggested to strengthen preventive and early intervention of oral disease. Introduction: Psychological constructs have been found to have potential effects in the improvement of health. Self-esteem (expressed in the form of sub-constructs: Self-liking and self-competence) is a construct, which makes one realize the self. This in turn will result in positive oral-health-seeking behavior and improvement in oral health status. Aim: To assess the relationship of self-liking, self-competence with self-reported oral health status in children aged 15 years, in Davangere city. 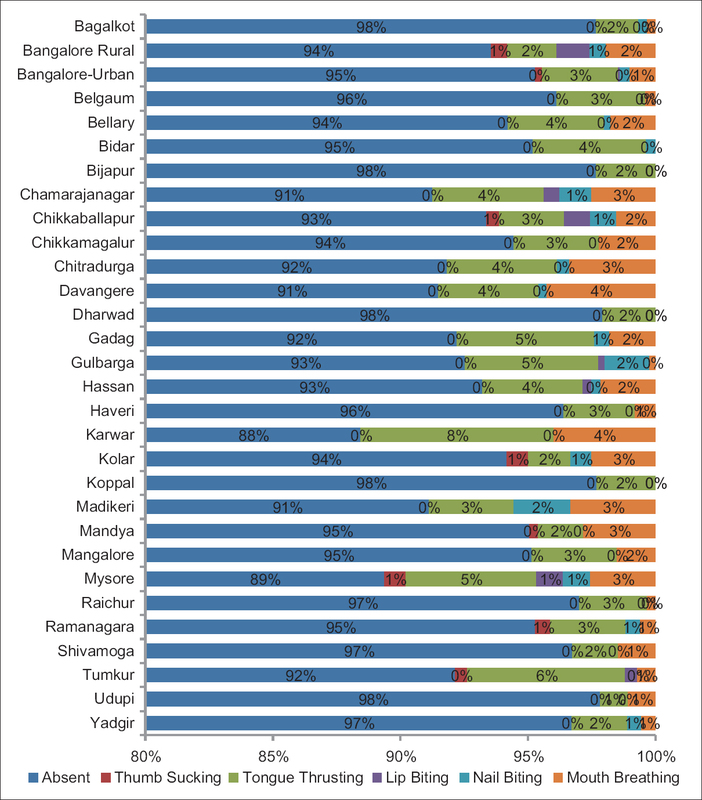 Materials and Methods: A descriptive, cross-sectional survey was conducted on 220 15-year-old subjects in Davangere City. Specially designed pro forma containing Romanian self-administered questionnaire to record the self-reported oral health status and Tafarodi's SLC scale to measure self-liking/self-competence was used. Chi-square test was used for statistical analysis. Results: A majority of the participants were found to have moderate self-competence and self-liking and their self-reported oral health status was expressed as "excellent." They reported very less or no untreated decayed teeth and no extracted teeth or gingival bleeding. Conclusion: The participants with better self-competence and self-liking perceived their oral health status as good. They reported lesser incidence of oral diseases and discomfort. Self-esteem and oral health were found to be positively related. Introduction: Medical emergencies can occur frequently in the dental setting. Effective management of an emergency situation in the dental office is ultimately the dentist responsibility. The assessment of preparedness of dental practitioners would help to bring about required changes in the teaching aspects of dental institutions, which would ultimately help dental graduates to improve knowledge regarding management of medical emergencies. This would also make dental offices available with required emergency drugs. Aim: To evaluate the preparedness for medical emergencies among the dental practitioners in Khammam town. 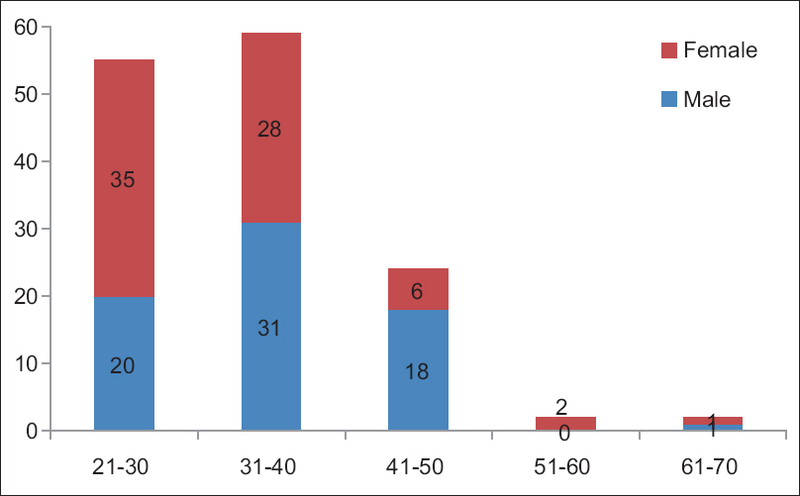 Materials and Methods: A cross-sectional questionnaire-based study with a sample of 301 was conducted among dental clinicians at Khammam to evaluate their knowledge regarding medical emergencies. The questionnaire consisted of nineteen questions. First nine questions are objective questions, requiring a simple yes or no reply. Next ten questions are multiple choice questions regarding Emergency Medical Services and basic life support. Chi-square test was used to analyze the data. A P < 0.05 is considered significant. Results: The results of this study showed that almost all the participants (94.02%) enquired about medical and drug history, but only 67.11% of them obtained a complete health history proforma of the patient. About 83.06% record vital signs, 74.09% of members report about attending workshops on emergency training and management, and 50.5% of members were either not sure or not in a position to handle the emergency condition. Conclusion: The results of this study reflect an alarming situation of the capability of dentists to deal with medical emergencies at dental offices and make available all the emergency drugs at their offices. Introduction: Telemedicine is a rapidly forming subset of health informatics. Until now, no studies are documented on the knowledge, awareness, and attitude of practicing dentists on teledentistry. Aim: To conduct a survey among the practicing dentist regarding knowledge, awareness and attitude among practicing dentists about teledentistry in Indore, Central India. 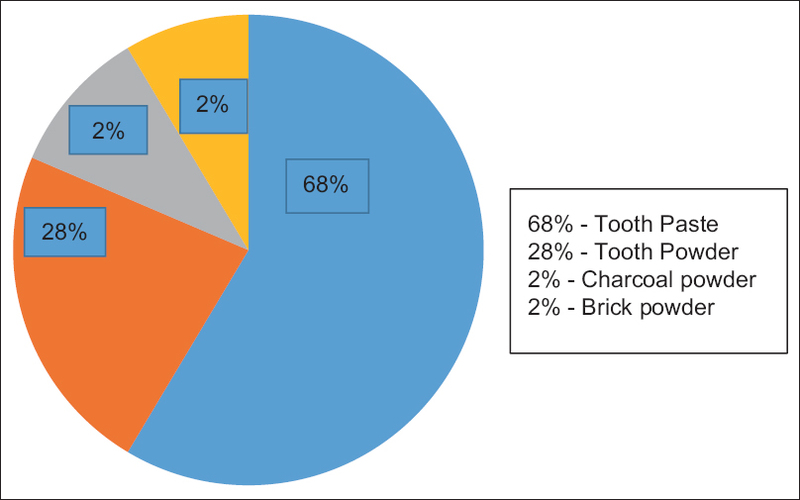 Materials and Methods: A cross-sectional questionnaire study was conducted among the practicing dentists from April 2014 to July 2014 in Indore. The sample size of 142 dentists was selected through convenience sampling. Chi-square test was used for the association. Results: Overall 121 dentists had heard about teledentistry. Internet was recorded as the most common source of obtaining information about teledentistry. In this study, almost 20 BDS dentists said that teledentistry is useful in oral medicine and radiology. Conclusion: Most of the dentists were aware of teledentistry, and the practicing dentists are aware of working technique, uses and advantages and disadvantages of teledentistry. Until date, no teledentistry projects in India, although there are few telemedicine projects run by the Government of India. There are a lot of gray areas in teledentistry to be worked on. Introduction: Tobacco smoking is a major cause of preventable morbidity and mortality. The prevention and control of adverse health effects associated with tobacco consumption is an emerging issue of public health significance. Aim: To assess the knowledge, attitude, and practices among health professionals (HPs) toward tobacco cessation (TC). Materials and Methods:A cross-sectional study, using pretested structured questionnaire was conducted among 422 medical and dental practitioners, to obtain information on the TC. The data were descriptively analyzed and Chi-square tests and multivariate analysis was applied using SPSS version 20. Results: Dental professionals had better knowledge about various preventive measures regarding TC as compared to medical professionals. Nonsmoker professionals advised patients to quit tobacco 10 times more than the smokers. Most of the HPs (91.9%) had a similar belief that TC counseling is not effective due to lack of formal training (P < 0.001). Conclusion: This study suggests a need and a desire for HPs to improve knowledge, attitudes, and practices in dealing with tobacco smoking cessation in their practice. Introduction: Tobacco as a slow and modern epidemic remains a serious public health problem for the country. Despite the existence of a comprehensive law to reduce tobacco burden, India still faces the uphill task of its acceptance and successful implementation. Aim: To assess the implementation of Cigarettes and Other Tobacco Products Act 2003 (COTPA)-2003 (Section 4, 6b, and 7) in public places of Bengaluru city and to assess the awareness of the head of these institutions/offices regarding COTPA-2003 and its enforcement in their premises. Materials and Methods: A cross-sectional study was conducted in 175 public places selected as sources of data using cluster random sampling. The tool in the form of a checklist was prepared based on the sections of COTPA-2003 (Cigarettes and Other Tobacco Products' Act), and data were recorded through direct observation. A structured interview was conducted of the institutional heads regarding the implementation of COTPA-2003 in their premises. Informed consent was obtained from the institutional heads or in-charges of the public places. Results: Section 4 (Prohibition of smoking in public places) was not complied by 58%. Only 16.7% educational institutions complied with the Section 6b (Prohibition of sale of tobacco products near educational institutions). More than 50% of the head of the institutions were unaware of their role in the implementation of this law. Conclusion: Although the law has been drafted comprehensively, it is implemented only to a certain extent. Hence, all concerned departments and ministries responsible for meeting the framework convention on tobacco control objectives and enforcing COTPA, at central and state levels, should act urgently and in coordination. Introduction: There is a growing recognition that the emerging workforce has very different professional expectations to those of earlier generations, with implications for the profession, patients, and the performance of health systems. Aim: To investigate factors that lead to the choice of dentistry as an occupation among the 1st year dental students in three private dental colleges in Bhubaneswar, Odisha, India. Materials and Methods: A cross-sectional survey of 268, 1st year Bachelor of dental surgery students was carried out using a self-administered questionnaire. The questionnaire consisted of total 21 close-ended questions, which included demographic (age and gender) and career choice-related items. Data were collected, analyzed, and was represented as numbers and percentage. Chi-square test was applied for gender wise comparison for the questions pertaining to future plans. The level of significance was set at P < 0.05. Results: A total of 234 duly filled forms were included for the statistical analysis. The majority of respondents were female (n = 158, 67.52%). The extremely important reason for the respondents to choose dentistry as their career choice was that dentistry has more regular hours than other health related professions and would let them make a lot of money (n = 92, 39.31%). This study revealed significant differences between males and females with respect to their perceived future plans. Conclusion: The results of this study highlighted some important influential factors in the choice of dentistry as a professional career. Introduction: The concepts about dental caries and periodontal diseases are learned at dental schools may directly influence the conduct of the future dentists regarding the control and treatment of these diseases. Aim: To assess the variation in the understanding of the concepts of dental caries and periodontal diseases among first to final year undergraduate dental students. 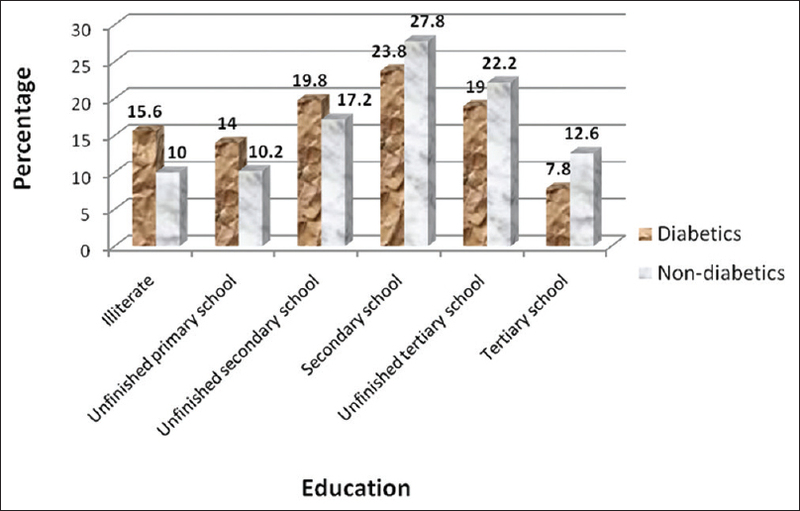 Materials and Methods: A cross-sectional, questionnaire-based study was conducted among 400 students pursuing their graduation in a private dental college situated in Sri Ganganagar city, Rajasthan, India. Descriptive analysis was done, and Chi-square test with a significance level of 5% was done to compare the frequency based data. Results: For concepts related to dental caries, the 1st year students' response showed shift toward biological concept, which was also present for the 2nd year but the 3rd year onwards the majority of students cited the comprehensive multi-factorial concept (P = 0.0002). Final year students were more knowledgeable than the 1st, 2nd, and 3rd year students regarding gingival bleeding, swelling, redness, and bad breath being the most important signs of periodontal disease (P = 0.004). Conclusion: Significant variation in the school of thoughts and limited knowledge regarding the concepts of common dental diseases among dental undergraduate students is seen. There might be a need to reform the initial concept building methods utilized in dental institutions to improve the basic knowledge of undergraduate students of the common dental diseases. Introduction: Attitudes of dental students toward their own oral health affect their oral health habits and also have a possible influence on the improvement of the oral health of their patients and society. Aim: To evaluate self-reported oral health attitude, knowledge, and behavior among a group of dental students of one of the dental colleges of Rajasthan and to compare differences in oral health attitudes between years of study and gender. Materials and Methods: In a cross-sectional study, a self-administered structured questionnaire consisting of 19 questions on attitudes toward dental care, oral health practice and knowledge of oral health was distributed to 200 dental students of different years of course. Data collected was subjected to statistical analysis. Results: In the present study, 142 students were from preclinical years and 58 students were from clinical years. Most of the students brush their teeth once daily for 2 min following roll technique of brushing before breakfast using only toothpaste as a cleaning aid. All students from clinical years routinely examined their oral cavity while most of the students visited the dentist only when required. 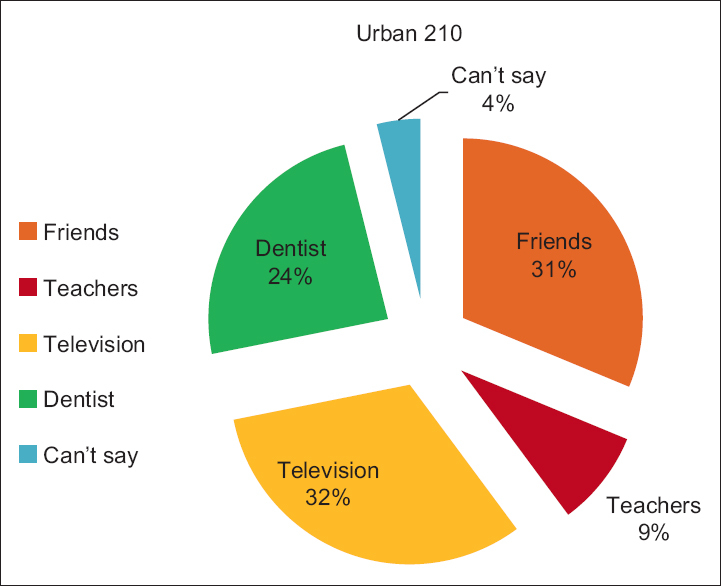 Majority of students considered oral health as important as general health and believed that oral health affects the general health. Students were also aware of the harmful effects of tobacco while only few of them were indulged in them. 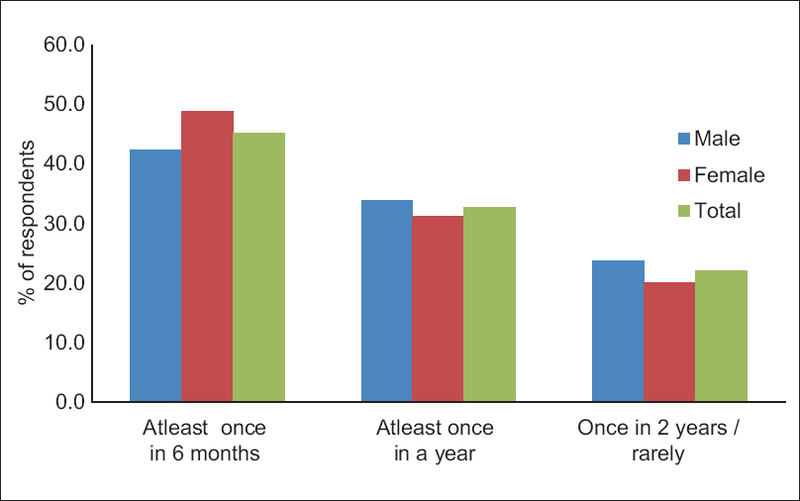 Conclusions: With increasing years of the study, some aspects of dental student's oral health attitude and behavior improved but this improvement was limited. Thus, the students should be motivated to become an example of oral health for the society, for which few steps to motivate them toward better oral health are proposed. Introduction: Unsafe injection practices are commonplace in developing country health settings. These unsafe practices predispose the health care workers to various risks and also facilitate transmission of an array of diseases to the health care professionals and the community. Aim: To assess safe injection practices and disposal methods among nursing personnel at health care centres. Materials and Methods: A hospital based cross-sectional study was conducted among 86 nurses at health care centres of rural Bengaluru. Data were collected using a 20 item questionnaire. Along with demographic details questions regarding knowledge, practices, and disposal methods were included. Data were subjected to descriptive analysis. Results: The study population consisted of 89.5% female nurses and 10.5% were males. Among them only 46.5% were protected by hepatitis B vaccination. During the last 12 months 25.6% nurses had accidental needlestick injury (NSI). The subjects who practiced squeezing out blood at the puncture site and washed their hands immediately after NSI were 51.2%. A total of 82.6% of the subjects were of the opinion that human immunodeficiency virus/AIDS was the only disease transmitted by unsafe injection. Regarding the methods of disposal of used needles and syringes in their hospital 89.5% had no information of the same. Conclusions: There is a great disparity between the ideal and practiced methods among the nursing personnel. There is an immediate need to reinforce the importance of safe practices periodically through training and motivation on safe injection practices and its disposal. Introduction: Aged people living in residential homes have a higher prevalence of depression and stress which cause oral health-related problems, contributing to excessive morbidity, than do those who live in communities. Aim: To find the relationship between senses of coherence (SOC) and quality of life (QoL) using Geriatric Oral Health Assessment Index (GOHAI) among elderly residents of old age homes in Bengaluru city, India. Materials and Methods: A cross-sectional study was conducted among elderly residents of Bengaluru city, India. Data were collected using a validated questionnaire which record demographic details, oral hygiene practices, and oral health habits. SOC and oral health-related QoL was measured using 13-item short version of the SOC scale and 12-item GOHAI scale. Chi-square test and Pearson's correlation coefficient test were used for statistical analysis. All variables showing significant association (P < 0.05) were entered into a regression model to identify predictors of low GOHAI and SOC. Results: A total of 376 elderly residents participated in the study and completed the questionnaire. Among them 150 (39.9%) were men and 226 (60.1%) were women. SOC was statistically significant with gender (P = 0.008), marital status (P = 0.003), dentition status (P = 0.000), smoking (P = 0.043), and alcohol consumption (P = 0.043). Age (P = 0.036), gender (P = 0.045), dentition status (P < 0.019), and smoking (P = 0.042) were found to be associated with GOHAI, there also exist a strong Pearson's correlation (r = 0.712) between SOC and GOHAI scores. Conclusions: A strong positive correlation was found between SOC and GOHAI scores indicating elder's with low SOC had low GOHAI scores and vice versa. The elders in residential homes were found to have more self-reported oral health-related functional problems, so dental health education must be focused on the special needs of the disabled, dependant and socio – economically deprived geriatric population to improve their QoL. Introduction: Dental pain is the most common reason for the patients to visit a dental office and anxious patients typically expect more pain than they experience. Dental pain has an impact on the patient's oral health and quality of life. Aims: To evaluate and compare the dental pain and anxiety levels in both male and female patients prior to dental treatment and to assess the influence of oral health on the quality of life. Materials and Methods: A cross-sectional study was conducted at a Private Dental College in Tamil Nadu which included 201 patients consisting of 101 males and 100 females. 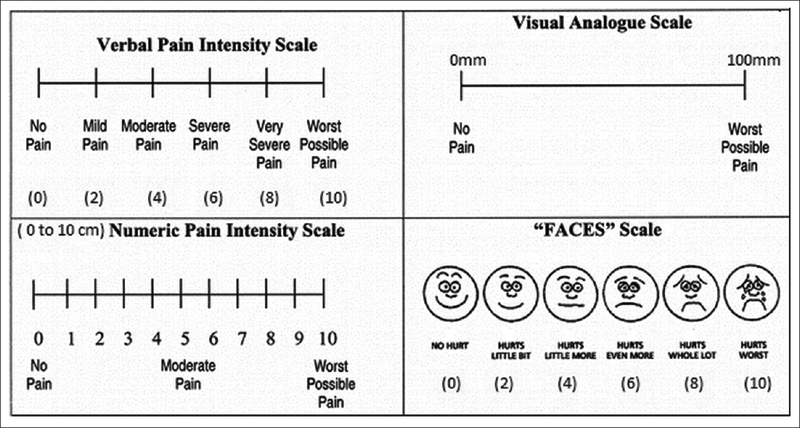 The origin of dental pain was identified and the patients were asked to indicate the level of pain experienced by them at the moment with the help of a 100 mm visual analogue scale (VAS), numerical scale (NS), verbal pain rating scale (VRS), and faces pain scale. The Modified Dental Anxiety Scale (MDAS) was used to evaluate dental anxiety before self-assessment questionnaire, Oral Health Impact Profile-14 (OHIP-14) was used to assess the impact of dental pain on the quality of life of the patients. G* Statistical software was used for statistical analysis. Results: The mean age of males was of 36.57 years and for females it was 35.50 years. The number of patients who had pulpal pain (68.66%) was greater than those who had periodontal pain (29.35%). The mean score of VAS for males (55.41 ± 20.43) was significantly lower than the females (62.51 ± 1.73). The mean score of NS was 54.46 ± 20.71 for males and 62.50 ± 21.38 for females. Severe pain was reported by 27% females and 15.8% males in VRS. It was found using the MDAS that 5% of females and only 1.5% of males had dental phobia. The mean OHIP-14 score was 19.73 ± 9.43 for females and 16.67 ± 8.72 for males. The male patients reported a lower impact on oral health than the females. Conclusions: The level of pain and anxiety experienced by female patients are greater when compared to males. Dental pain affected the quality of life and the impact being higher in case of females. Introduction: Oral health literacy (OHL) is the ability of an individual to function independently in certain areas of oral health care activity. It has now evolved as an important determinant of oral health related behavior and practices in any population thus affecting a person's health outcome. Aim: To assess the OHL levels among the sample of a population visiting private dental college and hospital in Dharwad. Materials and Methods: A cross-sectional questionnaire study was conducted on patients visiting a private dental college and hospital in Dharwad. Data was collected from 225 subjects through questionnaire related to five different areas of health care activity. Responses were scored on a dichotomous scale. Analysis of variance and independent t-test were used. 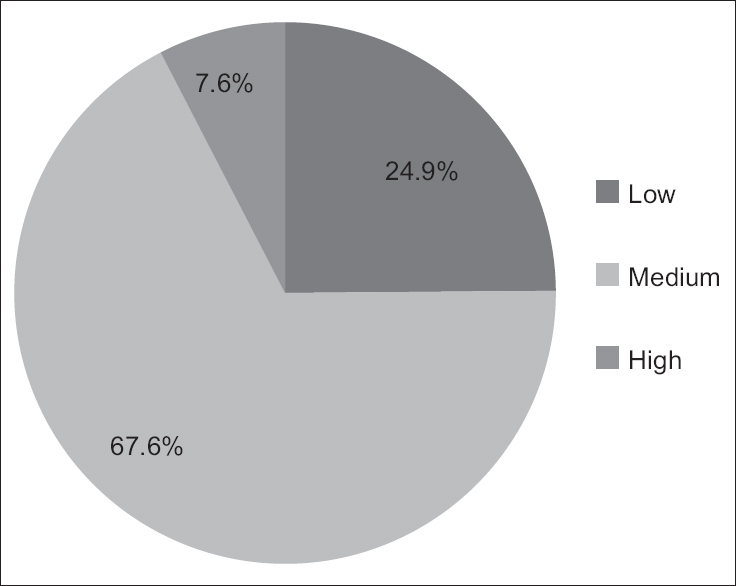 Results: Among the study population, 67.6% had medium OHL levels, 24.9% had low, and only 7.6% had high OHL level. OHL had a significant association with age and educational qualification (P < 0.05), whereas gender had no significant association (P < 0.05). Conclusion: Majority had an OHL of medium level as age advanced OHL was lower. As the educational qualification was higher, OHL also improved. This makes education an important parameter in improving the OHL. There is a need to consider OHL while planning future oral heath related programs for this population. Introduction: The railroads of India are the fourth most heavily used system in the world. Railways are one of the main modes of transport and millions of people travel by train daily. Aim: To know the opinions of commuters in receiving oral health messages in railways station through various methods and also their knowledge and practice regarding oral hygiene. Materials and Methods: Using convenient sampling method data from the commuters was obtained by a pretested questionnaire through interview method from 14 railway stations of South Central Railway zone. Pearson Chi-square test was used to compare the opinions of commuters based on their gender to receive oral health messages. Results: A total of 596 (97.3%) responded to the survey; a maximum of 297 (49.8%) subjects strongly agreed to the statement that railway platforms should have informative posters on oral health. A maximum of 188 (31.5%) commuters strongly agreed that prerecorded messages on oral health if played before the announcement of arrival and departure of train will be helpful to spread oral health awareness. 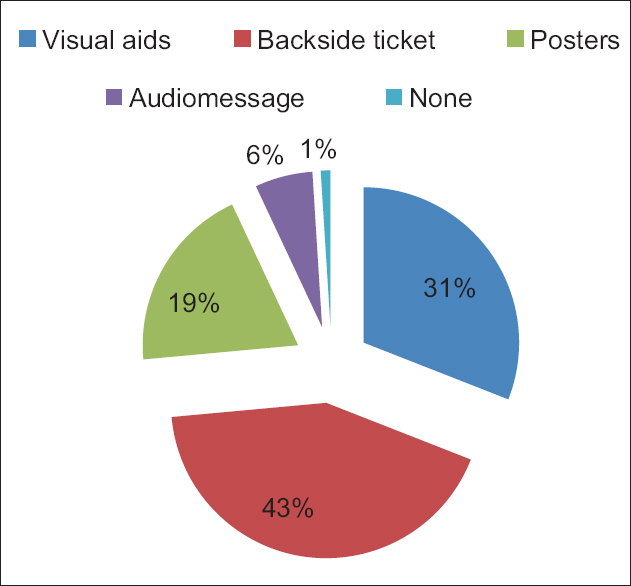 Majority of 43% commuters (255) preferred to receive oral hygiene instructions printed on back side of the ticket followed by messages on television and through posters. Conclusion: Majority of the commuters preferred to receive oral health information in railways stations. Hence, efforts can be directed in spreading oral health information among public through railways. Introduction: Stem cells are clonogenic cells capable of both self-renewal and multi-lineage differentiation. Stem cells have been isolated from various tissues, including umbilical cord blood, bone marrow, neural tissue, skin, retina, and dental pulp tissue. Objectives: To assess the knowledge and awareness about stem cells and dental stem cells among expectant mothers and parents of elementary school children in Bareilly and Delhi cities. Materials and Methods: A cross-sectional survey was conducted in which a close-ended questionnaire proforma was given to a sample of 1009 subjects who are parents of elementary school children and expectant mothers from Bareilly and Delhi cities. After 1-week, the filled questionnaire proforma was collected back from the school children and expectant mothers. The results were analyzed using Chi-square test. Results: Out of a sample of 1009 subjects, 809 were from Bareilly (401 expectant mothers and 408 parents of elementary school children) and remaining 200 from Delhi (104 were expectant mothers and 96 parents of elementary school children). The awareness about stem cells was 25% from Delhi and 18% from Bareilly and this difference was statistically significant. Conclusion: The awareness regarding stem cells and dental stem cells was generally poor among the parents of elementary school children and the expectant mothers. It is time to develop and cater programs to improve the awareness related to stem cells as stem cell therapy is said to have immense potential. Background: Greater Hyderabad Municipal Corporation (GHMC) cares for every child. It has introduced a short message service (SMS) reminder scheme for children's vaccination, to make their life healthier and secure. SMS as a reminder tool can be extremely effective in health care. Aim: To assess the effectiveness of vaccination SMS reminder scheme by GHMC on mobile phones of parents. Materials and Methods: A cross-sectional study was conducted on 349 subjects whose children were born between January 1, 2014 and June 30, 2014 using telephonic survey method from five hospitals selected randomly. Telephone calls were made to interview using a structured questionnaire. Results: Among 349 subjects, 279 participated in the study for phone interview and 70 subjects (20.1%) did not participate. Among 279 subjects, 21.8% (76) subjects received SMS from GHMC whereas 43.8% (158) did not receive, 4.58% (16) subjects do not know how to read SMS, 7.2% (25) subjects did not see the messages and 2.6% (9) subjects were not sure if they were receiving the SMS from GHMC or not. Majority of subjects 71.9% wished to get the reminder SMS from GHMC regularly. Conclusion: The use of SMS reminder scheme for children's vaccination was encouraged by majority of subjects. However, the GHMC scheme was efficient in reaching only 21.8% of the subjects. Introduction: There is an exponential growth in the field of herbal medicine because of their natural origin, easy availability, efficacy, and safety. Aim: To compare the antimicrobial effectiveness of Neem and Babool on Streptococcus mutans. Materials and Methods: An in vitro study was conducted to compare the effectiveness of 5%, 10%, and 50% of Neem and Babool aqueous extract with 5%, 10%, and 50% of 0.2% chlorhexidine mouthwash on S. mutans. The ditch plate method was used to test the antimicrobial activity. Ditches were prepared on blood agar plates with the help of punch having 7 mm diameter. The plates were left for 1 h at room temperature and then incubated at 37°C for 48 h and examined for zone of inhibition. Results: Inhibitory effect of 5% Neem is significantly better than 5% Babool and 5% chlorhexidine mouthwash (P < 0.05). At 10% and 50%, Neem and Babool are significantly better than chlorhexidine mouthwash (P < 0.05). Inhibitory effect of Babool increases as the concentration increases (P < 0.05). The inhibitory effect of 5% and 50% chlorhexidine mouthwash is better than 10% chlorhexidine mouthwash (P < 0.05). Conclusion: Aqueous extract of Neem exhibited the highest antimicrobial activity compared with Babool and chlorhexidine mouthwash.